The 25th Oregon Brewers Festival wrapped up a week ago. It was another big success for beer fans and for the economic well-being of the city, which I'll get to in due time. This is my look back at this year's OBF. The folks who track such things say attendance was 80,000. That number has stayed steady for the last few years and I suspect it is nothing more than an educated guess. Landing on an exact number would be nearly impossible since many of the same people pass through the gates on multiple days. As mentioned earlier, Thursday is no longer a secret. The Thursday afternoon crowd was enormous by historical standards. Friday was less crowded than usual, I thought, probably having to do with the (sketchy) weather. Saturday was a disaster...packed to the gills early on. I didn't attend on Sunday, but I'm guessing it was a not all that busy. I heard a lot of bitching about the Saturday crowds. Indeed, the lines were long by mid-afternoon and there was no getting around under the tents. Some people were complaining that there were fewer people pouring beer. Maybe so, I don't know. The main issue, I think, was that there were just too many people in the park. People who might have come on Friday came on Saturday because the weather report was better. Look, the only way to alleviate the problem with lines is to limit the number of people in the park at any given time. They could do that by pre-selling tickets for specific drinking sessions. That's what they do at the Great American Beer Festival. The OBF could do this, but it would require extensive changes to the way they do things. I suspect it will only happen when people stop coming due to the crowds...which essentially means it isn't happening anytime soon. I did my best to taste as many beers as possible during my three stints in the park...my notes suggest I tasted in the neighborhood of 50 beers. I had a few favorites, which I'll get to, but the whole experience got me wondering how much beer is consumed during this event. Would 1,500+ kegs fill it? 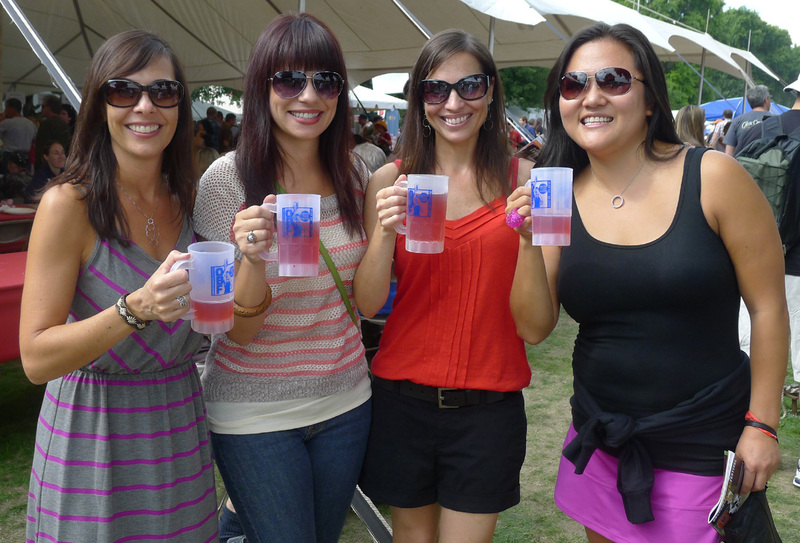 Festival organizers don't give out specific details on beer consumption. What they will say is that each attending brewery supplies a minimum of 18 kegs. 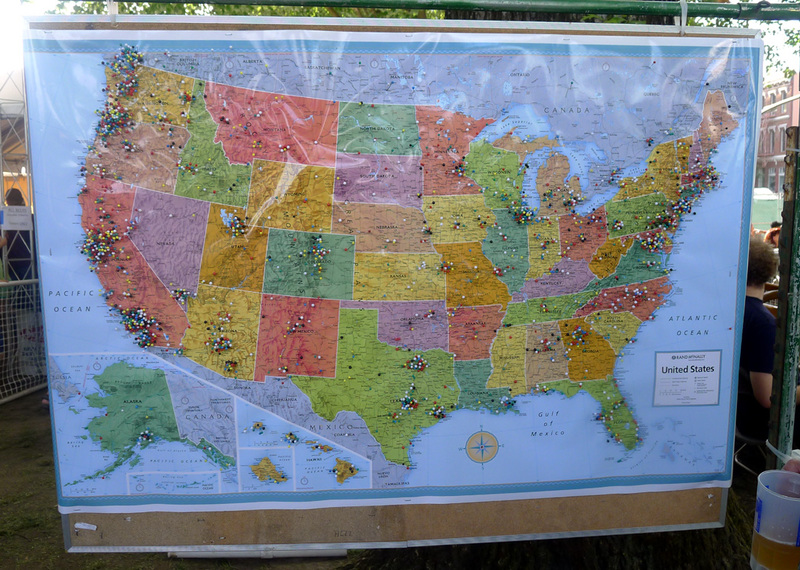 There were 84 different beers this year (82 breweries), so the total number of kegs was at least 1,512. Doing the math, that comes to 22,680 gallons of beer. By the way, this number excludes the Buzz Tent beers. Where could you fit 22,000 gallons of beer? Well, it turns out 22,000 gallons would fill a medium-sized backyard swimming pool. Not that you would want to. Most of these beers were pretty good and they certainly don't belong in a pool. Still, that's one approximate volume equivalent. It's a little late to talk about beer highlights, but these are a few that I liked (in no particular order): Occidental Kellerbier, Gigantic Dynomite, Redhook Peach Trippel, Epic Hop Syndrome Lager, Ram Berry White, HUB Imperial Sunshine, Dunedin Chronicle IPA, Ballast Point Sculpin IPA, McMenamin's Gilbert Grapefruit (Buzz), Cascade High Class Blond (Buzz). I have to admit some of the beers on my original tasting list didn't pan out. Speaking of beers that didn't pan out, I ran into to some young ladies who were sipping a fruit beer Friday afternoon. I stopped to ask what they were drinking and it turned out they were all drinking 10 Barrel's Raspberry Crush. They weren't necessary lovin' it, they told me, but it was okay. Raspberry Crush was on my tasting list and failed to make my short list of favorites. You can connect the dots. The biggest miss of this event in my mind was the handling of the beers in the Buzz Tent (which was also the Sour Tent, if you didn't know). 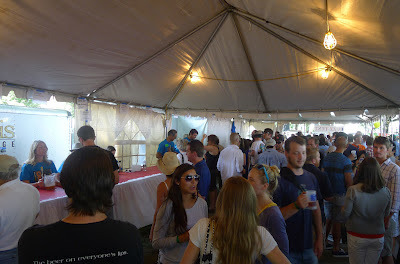 There was no advance information on the Buzz Tent beers and there was little if any information in the tent. I don't get it. These were double token beers, typically high alcohol beers, many of them barrel-aged. I can almost understand why you would want to keep the Buzz beers under wraps before the festival. But why would you not have information in the tent? One guy had gone to the web and gotten some info about the Buzz beer he was pouring...which he scribbled on a small piece of paper for patrons to see. He did it because he was embarrassed to give the patented Sgt. Schultz, "I know nothing, nothing!" response when asked about the beer he was pouring. Seriously? I hope this gets fixed next year. Water has been an issue for many years and I think it still is. They had several mug rinsing stations under tents at both ends of the park. You could theoretically get water to drink out of those taps, but the reality was a little different. There were lines to rinse mugs or get drinks. The flow of water out of the faucets was painfully slow. Not the best scenario if you want to stay hydrated while you're drinking. I honestly think water needs to be more readily available...and I don't mean the bottled stuff the food vendors were selling for a nice profit. 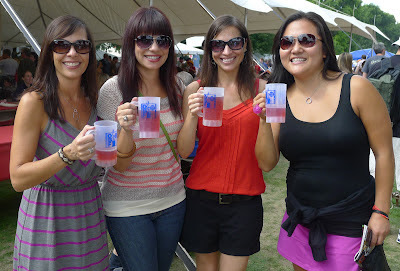 The OBF is Portland's original beer festival. When launched in 1988, its primary (arguably its sole) purpose was to promote craft beer. The festival has done its job so well over the years that it has spawned countless smaller festivals in Portland and around the region. Not all beer events are created equal, of course. Many of the newer festivals were invented mainly to cash in on the popularity of craft beer. Some aren't even a good value...largely because they're more concerned with making money then with promoting good beer. If you aren't sure who these festivals are, no worries...you'll figure it out. 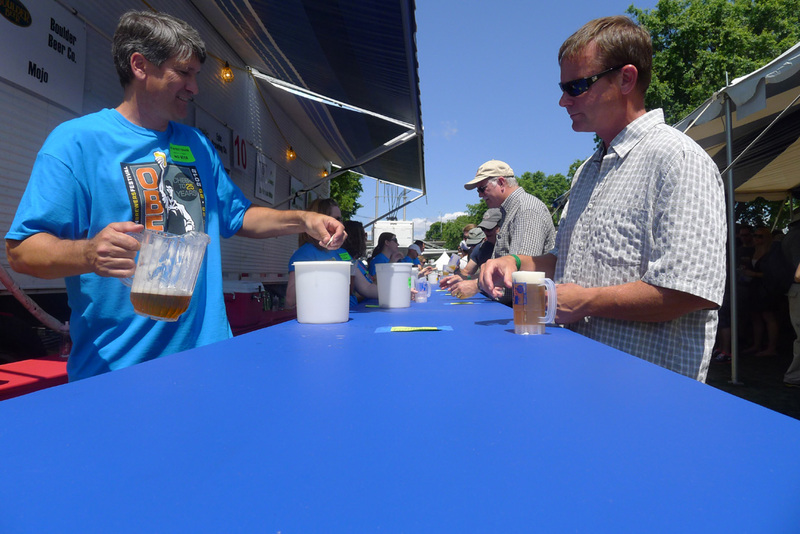 Don't get me wrong...the Oregon Brewers Festival long ago made the transition from promotional vehicle to money maker. If it truly does produce $23 million in economic benefits for the local economy annually (that's what organizers say), it's also true that a few people make a nice profit from this festival every year. Yet the beat goes on and the success seems to grow. To me, the key to the OBF's ongoing success is that they've found a way to balance profit motive with reasonable value. People come to Waterfront Park to enjoy good beers, live music and the great ambiance for not a lot of money. 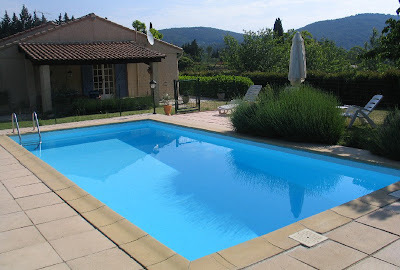 The value of the package makes it the quintessential event of the year. And it will likely maintain that title until something significant changes.